Luke Eddy played a somber Hamlet at the beginning, an antic one in the middle, and a mature one at the end, seamlessly transitioning from jester to philosopher to a Machiavellian who matched that of the king. The ASC’s touring troupe brought its three-show Stark Raving Sane Tour (including Rosencrantz and Guildenstern Are Dead) for its short residency at the Blackfriars, and the performance evidenced a troupe conditioned on playing to audiences on all sides. There was more than the usual in-script repartee with the audience on stage and in the pit, and fortunately a troop of Navy Junior ROTC cadets in attendance, paying intense attention to the play, were perfect foils. As Hamlet hosted the players driven from the city by the popularity of the children's theater, a cadet in the front row played Hercules rarely, flexing his muscles. Ophelia gave some of her flowers (shredded pieces of paper) to audience members. The old gravedigger used a cadet to illustrate the laws of suicide by drowning, solicited help from the front row cadets with his tools and skulls, and placed a cadet’s flight cap on Old Yorick’s head (and even broke the theater’s rules by allowing the troop’s teacher to snap a quick picture). 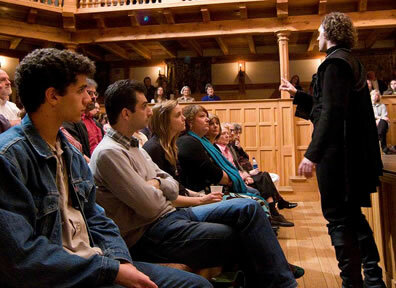 Luke Eddy as Hamlet giving one of his soliloquies at the Blackfriars Playhouse. Photo by Tommy Thompson, American Shakespeare Center. The troupe was prepared to do both the Quarto and the Folio version of the play. A member of the audience flipped a coin right before the play started to determine that they would do the Quarto version at this presentation. The play proper was then introduced by a slickly rhymed and pantomimed run-through of the entire play, but immediately the “platform” turned icy cold, pitch dark, and ominous with Francisco and Bernardo taking their watch at Elsinore. Throughout, the performances balanced the play’s comic and tragic moments, most exceptionally when Hamlet with his arm in one of his boots, came stamping on stage pretending to be a horse, and as the laughter subsided he eased into his “To be” soliloquy to rapt silence. One of the things that stood out in this production was how all the famous lines in this play seemed freshly spoken, and despite the number of times we’ve seen and read Hamlet they surprised. This Hamlet also used as its visual theme the “love tokens” Hamlet and Ophelia twice exchanged. The discarded letters littered the stage after the nunnery scene, and Hamlet was holding one when Polonius asked him what he was reading: “Words. Words. Words,” Hamlet replied in increasingly aching heartbreak. The letters then become Ophelia’s bouquet. Luke Eddy played a somber Hamlet at the beginning, an antic one in the middle, and a mature one at the end, seamlessly transitioning from jester to philosopher to a Machiavellian who matched that of the king: when Hamlet sneered that Claudius should send for Polonius in heaven and, not found there, “seek him in the other place yourself,” the audience reacted with an “oooohhh” the put-down merits. Rosencrantz and Guildenstern were no match to this Hamlet, though the foppish performances of Rick Blunt and Ginna Hoben, respectively, had us looking forward to the Stoppard play. Unfortunately, Aidan O’Reilly’s wimpy Horatio was no match for this Hamlet, either (woe to Denmark when this Horatio is the only one left); but a nice touch when he was truly bothered by Hamlet’s sending R&G to their deaths. Dennis Henry’s Polonius was the proper balance of loving father, comic egotist, and political schemer. And special kudos to Daniel Kennedy as Fortenbras, the Gravedigger, the Player King, and the Ghost, whose “Horrors!” wail made us truly feel the fires of hell he was enduring thanks to being murdered in his sleep. Remembering that, we urge Hamlet to not kill Claudius at his prayers.